Development of a future commuter rail station in the city’s Barton Street neighborhood, once little more than a dream, is now a good possibility within the next few years, said state officials last week. City officials in Pawtucket and neighboring Central Falls say the train station would be a “game changer,” functioning as an economic driver and providing convenient transportation to commuters and tourists along the Northeast Corridor. I still don’t think it makes sense to build a station there. You’re less than 3 miles from South Attleboro Station. About twice that from Providence Station. 5-6 miles is more desirable; but the economic impact in Pawtucket would far eclipse any possible benefits of having people drive to a sea of parking lots in So. Attleboro. I say close So. Attleboro. How many people walk to So. Attleboro. Pawtucket Station is be a game changer. 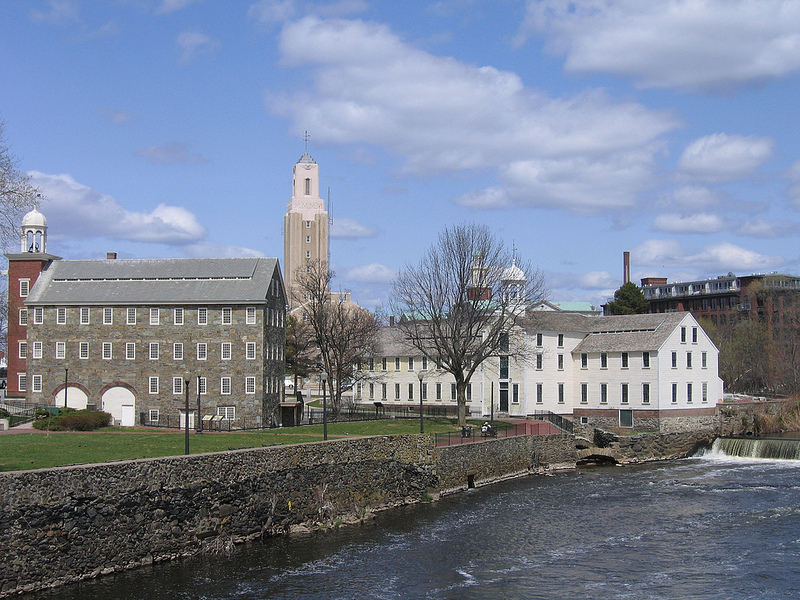 A three-mile walk to a stip mall does not a walkable, transit-oriented, vibrant downtown Pawtucket make. Neither does a half mile walk past parking lots to the train station a walkable, transit-oriented, vibrant downtown Pawtucket make. Why am I nervous that the most expensive (and extensive) component of this \”transit\” project is going to be parking? Two points that I think need to be made with regards to Pawtucket/South Attleboro. #1, per Tony P: Pelham and New Rochelle are 1.5 miles apart, New Rochelle and Larchmont are 2.1 miles apart, Larchmont and Mamaroneck are 1.8 miles apart… I could go right down the New Haven Line listing all the stop spacings that are 3 miles or less to make this point, but it’s probably easier to list all of the stop spacings that aren’t – not counting anything inside of New York City itself, the only stop spacings longer than 3 miles are between Stamford and Noroton Heights (3.2 miles apart), between Fairfield Metro and Bridgeport (3.1 miles apart), and every stop between Bridgeport and West Haven (when it opens) is more than 3 miles apart. #2, per Edgar: Probably nobody walks to South Attleboro, but I invite you to take a look at the tremendous number of cars that are parked there – plenty with Rhode Island plates, in fact! I’d say South Attleboro is doing a fantastic job serving as a park and ride – without it, these cars would be driving to another stop on the line or, more likely, just driving straight to their destination. Park and rides aren’t inherently bad, and like it or not, there is going to be a real need for some parking at some stops well into the future. Mind you, that doesn’t mean “make every stop into a park-and-ride.” Andrew has a good point, and is right to be nervous about the amount of parking VHB seems to think Pawtucket needs. But I was at the hearing on this and I pointed out then and I will point it out again now – the vast majority of the people who are going to drive to the train are doing so now. They’re driving to South Attleboro and parking there, or they’re driving to Providence and parking there. I would much rather we let them continue to keep driving to those stations and parking there than the alternative, which is having them drive to Boston and not use the train at all. They are driving to So. Attelboro because it is convenient for commuting to Boston. Exit 95 N and take the first right. Now compare that with driving to the station locations in Pawtucket or even driving and parking downtown. The only benefit to Providence is you have a garage and the platform is protected from the weather. It would be great is you could trace the RI license plates back to the town they are registered in. I think the results would be surprising. Did a study of TOD on the West Coast. Active in South Coast Rail Project. Grew up on Main Line in Philly. As pointed out by Ryan concern about space between stops is overblown when compared with older lines line in NY/Phila/Bos. Spacing required to accommodate the Accela is the main problem for RI TOD. Should also be pushing for a stop on Wellington Ave in Cranston. In both Cranston and Pawtucket you build it and they will come. You don’t build to an existing market. Transit is a game changer. It changes valuations, use, economic potential of the land. As for Attleboro planners always do license plate surveys of commuter rail stations. In Portland the head of their TOD efforts emphasized that is not a one size fits all proposition. Does not make sense to put excessive parking in Pawtucket if it is easier to park in Attleboro. You want a mix of sites – some commuter oriented and some development oriented. …park and ride – without it, these cars would be driving to another stop on the line or, more likely, just driving straight to their destination. Pretty much true, except, wherever density permits, how about buses feeding the train station? Done right? Fare unification and decent bus service might be cheaper than land acquisition for parking and more gold plated garages. My argument is that we already have enough parking up and down the line. What’s needed most now is to have the capacity to use the line to get places other than (in addition to) Providence. Trains are already blowing through Elmwood, Auburn, Norwood, Apponaug, Cowesett… the huge expanse of parking at T.F. Green Airport significantly reduces the amount of parking any proposal for Auburn or Cowesett would require and invalidates the parking component of any Elmwood, Norwood or Apponaug station. Norwood, in fact, deserves special mention for the fact that the Northeast Corridor actually impacted that neighborhood in a way not unlike the highways – Norwood has been cleaved in two, and everything west of the tracks has been rather unfortunately penned in between I-95 and the NEC, cut off from everyone as high speed cars and high speed trains blow by. With ample parking built out at T.F. Green, efforts at Norwood could be pointed firmly towards reconnecting the streets on either side of the tracks – if not as complete streets, then at least as pedestrian pathways through the station. The nay-sayers are always the ones who cry in their beer.Pawtucket is a natural for commuter rail.Within just 2 miles 70,000 plus,including ;yes ,people that need to be in Boston or Providence for that matter New York.Linking Pawtucket with the corridor is not a stretch.I’d give the city 10 years at best to be even more essential to Southern New England’s grid. what i enjoy about the comedic weigh ins on Pawtucket,is they are GMO’d out.Talk to me you minions of negativity. Social Justice. Many potential riders here don’t have cars. Who cares about parking? These comunities need access to this line more than you or I with our natural born American advantages. A train station in Pawtucket would be great. While my urban-minded disposition would much rather see a commuter stop in Pawtucket than a park & ride in the big box parking lot in South Attleboro – as others have mentioned, tons of RI’ers drive a short distance to S. Attleboro to take the train to Boston (colleagues of mine included). It’s easy to get to, and relatively cheap to park. Better than everyone driving to Boston. A station in Pawtucket would not serve these people; it would serve a different demographic: those who either live in Pawtucket, or don’t have cars, OR… new residents who move to a new TOD once a station is built! – People who want city living but can’t afford Providence or Boston perhaps. In order to take full advantage, there should be well-advertised and reliable shuttle links to downtown, and maybe McCoy Stadium on game nights. That way you are serving more than just RI-Boston commuters, and making Pawtucket more of a destination. Transit Oriented Development (TOD) has been a tremendous catalyst for the development and revitalization of communities very much like Pawtucket and Central Falls. These are areas where car ownership is lowest and where the need is the greatest. I also want to remind people that this station would be connected by BRT (Bus Rapid Transit) to Providence Station making the entire area a Transit enabled district. This is the strategy that was used in Emeryville CA where they connected their Amtrak station to their BART station with a free loop bus making the whole city car optional. Emeryville, a forgotten industrial area near Oakland, is now home to Pixar, Novartis, Peets Coffee, Whole Foods Headquarters and scores of new housing developments (pushing out the artists unfortunately).